Well, I finally got it. And since Marc gave me that great Snatcher poster, I believe that now I have all the official Snatcher Merchandise there is to have. Here are the pictures from the Tape and it's contents, as you can see it is in very good condition. The case has a few scratches, but the liner notes and the cover illustration are in great condition, I'll scan those later so we have something better than these crappy cellphone pics. You can click on each to go to the image on flickr, where you can get the full resolution if you want to zoom in. Here you can take a look at the back. As you can see the cover completely surrounds the Tape and even goes outside the packaging. i suppose that is the way all Japanese Tapes are, this is a first for me. I believe it is kind of like the Obi/Spine Card integrated into the Cover itself. Here is Side A from the Tape. on the background of these pics you cab probably notice that it also has the same sticker the CD has. I didn't bother to take a pic since it is the exact same one, but here is a link to the scan from the CD version anyway. So, how does it feel to have everything Snatcher-related? Feel any accomplishment? Like, for instance, if Kojima would ever decide to pop around to your house one day and see you have all that, you can only imagine the look on his face! It is a very personal collection. Of course only people from around here appreciate what it is, otherwise it is just for my personal enjoyment and for the occasion when some poor soul asks me about differences between Snatcher games I believe it has happened only once). It does feel nice though, but as expected a bit empty in a way. it's been more than 10 years collecting Snatcehr stuff. I still believe some small details can still be found. Like an obi I am missing or small things like that. i feel the same way about my sega saturn collection. got every single game released uk, us and jap. just wish i had your snatcher collection. Those sketches in those liner notes are from the original planned ending. They originally planned on having Randam live and having him go with Gillian and Metal to Moscow. 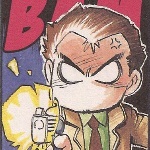 They reinstated that original ending in SD Snatcher. Congratulations on completing the collection, Artemio. I'm sure you could you consider yourself the world's leading authority on Snatcher, now. I'm sure that Project S approaching shadow means that this is only temporarily complete, though. reggarding Project S, I am not really excited about it. Or better put, I rather keep my hopes very low regarding it. And i wouldn't consider my collection incomplete when new merchandise arrives. it would kind of be like considering a Golden Axe Collection incomplete because Beast Rider came out. I mean, it won't be the same. You're far better off with that feeling towards Project S. I wish I felt like that, but I can't help but be excited to see what Suda51 and Kojima can pull off. I bought this tape new in Akihabara (Mr. potatoe) last september. It's an amazing piece ! I was really happy to find it . Great collection pal, it certainly amazed me. Specially a sealed tape and the sega review disc you have. I also have a review copy, but it was on konami's side. They must be different I guess, If you could do a binary compare of the images that would be amazing.
" the white one that has the PC Engine Art, the sega seal of quality and the old Sega CD logo at the bottom, what is that?" what tool would you recommand ? I made my own tool for that occasion, I'll send you that and the other tools I used when I get home. Hate to bump an almost nine(!) year old topic, but damn is that tape gorgeous. I really hope to find one myself someday; I collect tapes (mostly vaporwave albums), and this would be a crown jewel to both my tape and my Snatcher collections. Definitely. I'll continue to keep an eye out for it (and the Blaster too).